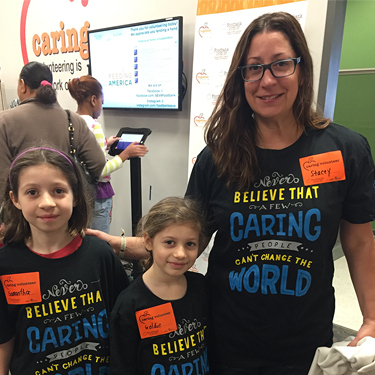 Stacey with her daughters Sammie and Goldie volunteering at the Food Bank. They made 650 food bags for local children in need. Stacey networking at the HRWIRE monthly meeting. 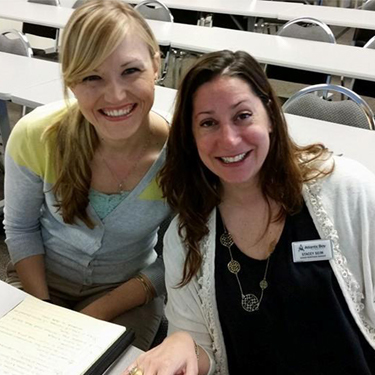 Stacey and team member Jennie Lindberg at the WCR Monthly meeting. Stacey serves on the board. Enjoying a great team night out. A knowledgeable and highly effective communicator, Stacey Seim has a reputation for getting challenging loans done. Consequently, friends and industry professionals often send people who have been denied by another mortgage banker to her as their last hope. Experienced in all types of loans, Stacey finds that many of her clients are first time home buyers and members of the military. We all share a passion for helping our clients throughout the entire home buying process and to ensure they have the highest customer service! A knowledgeable and highly effective communicator, Stacey Seim has a reputation for getting challenging loans done. Consequently, friends and industry professionals often send people who have been denied by another mortgage banker to her as their last hope. Experienced in all types of loans, Stacey finds that many of her clients are first-time homebuyers and members of the military. At one point in her 20-year career as mortgage banker, Stacey Seim managed a mortgage department, which gave her a lot of insight into the value of asking hard questions early in the process. She says, “I was in a role where I had to deal with a lot of difficult clients. In the majority of cases, I was able to turn that client around and make them happy again. It’s a matter of digging deeper.” Since joining Atlantic Bay in 2010, Stacey has applied that same drill down approach to helping clients navigate difficult situations. Stacey is the top-producing loan officer for Virginia Housing Development Authority (VHDA) loans in the Hampton Roads area, the social event chair of the Hampton Roads Women in Real Estate. She also volunteers for EQUI-KIDS Therapeutic Riding Program, a group that helps children with functional needs through horseback riding. I did not like the day of my closing. The attorney Atlantic bay uses was not good. The paper work was messed up and had to be fixed 3 times. Jonathan J. and Judith J.
Stacey Team walked us through the stressful process of obtaining a mortgage we appreciate doing business with them. Everyone was very professional knowledgeable and friendly everything was handled in a timely manner. Very Professional and the process was done in a timely manner. Stacey was awesome thru this whole process and kept us informed of every thing up until the day we closed. She also was available at any time day or night to answer our questions. James M. and Cathy M.
Assitance was prompt whenever we had a question. Fast response was the status quo. Stacey and tom are the best! Raymond C. and Karen C.
For me, the Atlantic Bay Mortgage Group team treated me like a king. They were always there for me. On top of that, all the team members of Stacey Seim's staff had knowledge of what was going on with my loan. Susie F. and Jeffrey F.
Jack F. and Kathryn F.
Thank you to you and your team, Molly and Robyn, for helping us through the loan process for our new home. This was the best experience we have ever had with a mortgage company and we have purchased six houses over the years. You were professional, efficient, knowledgeable, and simply very nice too, always answering our many questions completely and quickly. I was impressed with the status email showing the progression of our loan application and tasks completed...just a good experience from beginning to end. Our closing yesterday went smoothly and we are excited to be new homeowners again. Thank you also for the gift basket, a nice surprise, and on a more personal note...your sister Robyn is adorable! Thank you again for all your efforts and enjoy your vacation! John B. and Darlene B.
Darlene, Jake and Myself are ecstatic about the new home. We have been busy moving in over the past few weeks, and things have been hectic moving out of one and moving into the other especially because we are doing it ourselves since they are just 6 houses down the street. The other night Darlene and I were reflecting what was accomplished and how smooth everything went. We thank you for all your hard work in helping us get our home. You were not just professional you were also very personable. You gave us 100% of you time and attention, making sure we understood every aspect of the process, and when we had questions, no matter how simple they might have been, they were important to you and you answered them quickly, making sure we understood. It was a pleasure working with you, and we think about you every time we come home now. I guess it is the best compliment you can give a mortgage person when you tell them we may not need their services for a long time.....You helped us get our Home, and we plan on staying there for a very long time. We will definitely recommend you to anyone we know looking for a Mortgage Company, even more...a friend to help them get their new home. Thanks again, and drop us an e-mail from time to time. Extremely professional, patient, and knowledgeable with a great team; I am a highly satisfied customer and would definitely recommend Stacey. The process was extremely smooth and I was informed every step of the way. The loan process is very long and difficult even with "Excellent Credit". The documents that have to be submitted grew as the loan process moved to it's conclusion. Stacey was very patient and understanding about our frustration. She answered every question and there were many. And then, one day we were at the "settlement table", nervously we waited for something negative to happen, like, "Mr./Dr. G, we need another document". What we got were keys to our home, a gift and many smiles. Stacey was the glue that held this process together. Thank you! Stacey was excellent to work with. We could ask her anything via email and within minutes she would respond back with an answer. We even asked her things that didn't pertain to the mortgage process and she still managed to help us out. She was the perfect person to have as our lender for our first home. Thanks for the help Stacey! Awesome professional and courteous service! Alantic Bay and Stacey will help make your loan happen. Thank you Stacey!!! We recommend you to all our new people moving to the area. Eric S. and Lindsey S.
I'll keep this brief. I was recommended to contact Stacey at Atlantic Bay for a mortgage. They were fast, responsive, and competitive. From the time I applied to the time we closed was about 3-weeks, so I know they were hustling over there. I recommend. Have recommended ABMG to co-workers. I absolutely LOVE Stacey Seim and her team! They were extremely professional and wonderful to work with. Stacey was available to answer my questions via text, email, and phone with no problems. Atlantic Bay Mortgage, Team Seim was able to take our difficult situation and make it seem minor. They took our file in on short notice and turned it around for closing in 2 weeks! My husband and I are so grateful to Atlantic Bay, Team Seim, Stacey, and our realtor! We were able to give our kids the home they deserve. I cannot say enough about Stacey and the team! They were wonderful!!! Robin and Rose answered all my questions and even when we hit an obstacle they were still on my side. Stacey explained the process and it went just as she said. Every time I spoke with them it was like talking to a friend. They were professional, responsive, and proactive! I recommend Stacey's team 100% any day! Thank you for everything. I am enjoying my new home because of you. Ted B. and Valerie B. The entire process was handled with the highest degree of efficiency and pleasantry. A totally enjoyable experience. Dan J. and Lara J.
Kate O. and Nate M.
Stacey and her team were extremely easy to reach, efficient and responsive to our questions. The process was nearly seamless. Ups and downs, but in the end, it all came together. The Stacey Seim team is well organized, professional, polite, knowledgeable, caring, dependable but most of all their organization made my experience with home buying stress free. Stacey and her team were the absolute best. They were very professional and helpful with all information provided. They kept us in the loop and answered any questions we had and made sure all info provided was easy to understand. They are great and I would love to use them again in the future! Stacey and her team were extremely easy to work with and consistently kept in contact even if it was to just check in. They gave us facts without trying to "sell us" on something. I believe they truly work for their clients and do everything they can to help and benefit their client! I would absolutely recommend Stacey and her team and will use them again if the need ever arises!! Stacey and her team are terrific! She was able to get my refinance done in a very short period of time. She got me a great rate to boot. Everyone on Stacey's team went out of their way to be helpful. They explained every step and detail clearly. Stacey and team were awesome! She knew my stress and took good care of me. Highly recommend! This was probably the least complicated loan process I have ever been through. 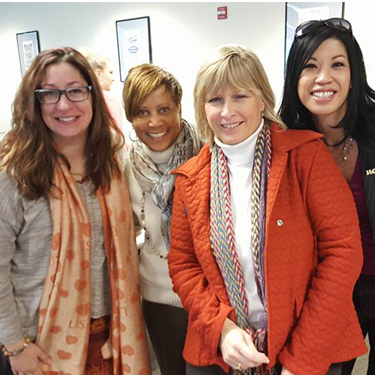 Gloria L. and Richard L.
Matthew C. and Schuylar B.
Stacey and her team made the mortgage process seamless. They were very meticulous and organized, and communicated every step of the way. Niya M. and Daniel M.
Stacey and her team walked me thru the entire mortgage lending process from the begining to the end. Stacey made the process easy and stayed in constant contact with me thru the entire process. Stacey, I would to thank you & your team for all of your hard work & dedication. My family and I love our new home & we look forward to making memories that will last a lifetime. Stacey and her team were very helpful and professional. They provided all necessary info and kept me in the loop with every step. I would definitely recommend to family and friends. David F. and Nina F.
Stacey and her team were very professional and efficient during the handling of our loan. Stacey was always available to answer our questions outside of business hours. It was a pleasure to work with Stacey and her team. Johnathan W. and Wendy W.
Stacey and her team did a great job! eStacey was fantastic. She helped my boyfriend and me on days it was convenient for us or whenever we had questions. Just a phone call away. We really appreciated it. Joan H. and Harold H.
Ashley H. and Blake H.
They were great! Very friendly and reachable. They took time to explain things. A++. Stacey and Robyn are amazing. Your team handled my loan very efficient and professional. Very happy. William Z. and Kaylyn M.
Stacey and her team were awesome. Very helpful, informative, friendly, and professional. Joshua R. and Catherine R.
Very attentive service. Accommodated any requests and overall enjoyable interactions. Dennis Y. and Marietta Y.
Robert Y. and Nicole Y.
Stacey was very friendly and helpful! Stacey and her team were very professional throughout the entire process. This was a very positive experience that satisfied all of my mortgage needs. I am so glad Atlantic Bay Mortgage Group delivered a smooth transition into our new home. Rudy V. and Andrea V.
Stacey and her team treated us with the utmost respect and were always available to answer our questions. We will be calling her again when we buy our next home! Ronald G. and Nancy G.
Working with Stacey was a pleasure. Stacey and her team were there every step of the way. David A. and Karen A.
Atlantic Bay Mortgage Group is the easiest company to work with, and I loved the buying process. Tami A. and Mark A.
I had a great experience with Stacey! She worked with me throughout the process and made sure that I got the best rate possible. Stacey was awesome! Stacey was very knowledgeable and always available to answer and address my concerns. When I was unsure she always made me comfortable and took time to break the numbers down for me. Roger E. and Merle E.
Stacey Seim and her team were excellent, professional, had good communication, and efficient customer service. We loved working with them! Zane W. and Star B.
Stacey and her team were an awesome group of people. We will and have referred people. Richard Z. and Andrea Z.
Jimmy W. and Anna W.
Atlantic Bay Mortgage Group was fantastic. We were first-time homebuyers with tons of questions. Everything was answered promptly and we felt very comfortable with the answers we received. The whole process was thoroughly explained to us and everyone was so friendly. Jamie K. and Brad K.
Stacey was excellent! We received really quick service she was always on top of everything! Atlantic Bay Mortgage Group was very quick with processing my loan! Troy R. and Patricia R.
I love that Stacey and her team are always on top of their game! Manuela D. and Vernon D.
Team Seim made my experience seamless as they explained the process, kept me informed, and were always available when Needed! Kudos to Stacey Seim and her team! Ashley H. and Adam E.
From start to finish, the service was awesome. This was our first time purchasing a home so we had lots of questions which were all answered thoroughly. Always a great experience and a very caring and professional company to work with. Michael W. and Laura W.
All employees of Atlantic Bay Mortgage Group that I worked with were knowledgeable, professional, and prompt in response!